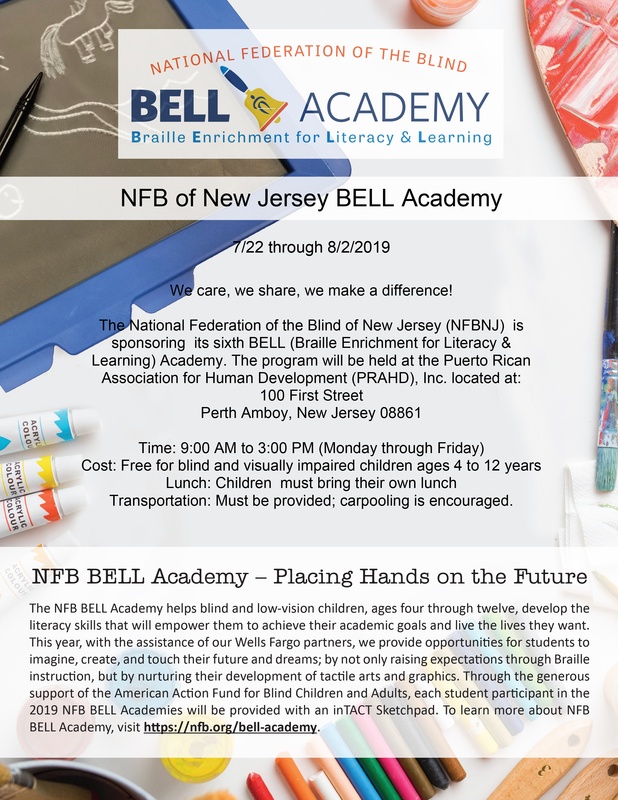 The National Federation of the Blind of New Jersey (NFBNJ) is sponsoring its sixth BELL (Braille Enrichment for Literacy & Learning) Academy. The NFB BELL Academy helps blind and low-vision children, ages four through twelve, develop the literacy skills that will empower them to achieve their academic goals and live the lives they want. This year, with the assistance of our Wells Fargo partners, we provide opportunities for students to imagine, create, and touch their future and dreams; by not only raising expectations through Braille instruction, but by nurturing their development of tactile arts and graphics. Through the generous support of the American Action Fund for Blind Children and Adults, each student participant in the 2019 NFB BELL Academies will be provided with an inTACT Sketchpad. To learn more about the NFB BELL Academy, visit https://nfb.org/bell-academy. Upon completing the application form, please complete the student permission and release forms at https://archive.nfb.org/bell-permission-and-release-forms. Thank you for getting the word out and thank you to The Allergan Foundation for transforming dreams into reality with your generous grant! To view all pictures and videos from current and previous BELL Academy programs, please visit our BELL Academy Pictures page. The National Federation of the Blind of New Jersey Code of Conduct and the National Federation of the Blind of New Jersey Sexual Abuse, Molestation and Harassment Prevention Policy will apply to our gatherings during the BELL Academy. Please consider the opportunity to help sponsor some part of the Braille Enrichment for Literacy and Learning (BELL) Academy this summer. The dates and location for the 2019 BELL Academy program are July 22 to August 2 in Perth Amboy. The BELL Academy is a two-week program for vision impaired and blind children ages 4 through 12, many of whom have had minimal exposure to braille. The program presents opportunities to enhance braille and blindness skills. Instruction in activities of daily living furthers the children’s independence and self-sufficiency. Blind mentors and volunteers provide excellent role models, keeping expectations high and proving that blindness is not the characteristic that defines one’s future. All BELL Academy children receive a free white cane and a free slate and stylus from the National Federation of the Blind. To learn more about the NFB of New Jersey BELL Academy program, please read the affiliate-specific Frequently Asked Questions brochure for New Jersey at https://nfb.org/programs-services/nfb-bell-academy/new-jersey. For more information, please contact Mary Jo Partyka, our state BELL coordinator, at choirnfb@gmail.com or by phone at 609-888-5459.